Holiday Inn Express is near KU. Jayhawk fans and Kansas travelers love our hotel's location. 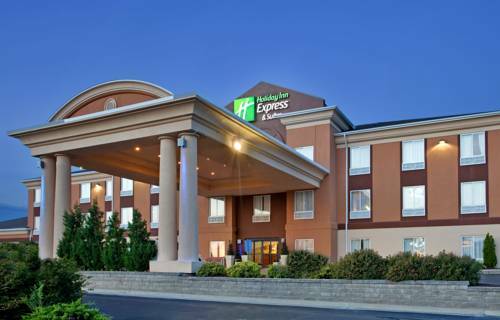 The Holiday Inn Express in Lawrence is just minutes from KU, Allen Fieldhouse, Rock Chalk Park and Memorial Stadium. Does business bring you to Lawrence? Our hotel offers a convenient location and first-rate corporate amenities that include free Wi-Fi. 1,200 sq ft of event space makes us a great choice for meetings, reunions or receptions for as many as 80 guests. Thinking about a vacation in Lawrence? Our hotel is the perfect starting point. Besides being near the historic downtown KU, guests can easily enjoy local attractions. Head to KU and visit the Booth Hall of Fame to see the high points in Jayhawks athletic history. Stop by the Spencer Art Museum, Lied Center, or Alvamar Golf Course. Why not pick up one of the complimentary bikes we offer, and bike the scenic hiking and biking trails around the hotel? You could even walk to the movie theatre that's across the street. Enjoy the New Mexican Restaurant next to the hotel. No matter what brings you to Lawrence, Kansas our hotel's outstanding service and warm hospitality will make your stay memorable. From the free breakfast each morning to the indoor pool, we feature the in room amenities like a microwave and a refrigerator. Take advantage of our Fitness Center, or share photos with free Wi-Fi. You'll see why we think we're the best guest experience in Lawrence! 1200 Square foot meeting space with window to the outside and three doors. Room is carpeted. Room has two cabinet areas with a small sink. Room has two partion walls that can be used to divide the space into different rooms. A relic of early roadside commerce, built in the late 1920s and shaped like a Goliath-size industrial-strength Indian teepee.